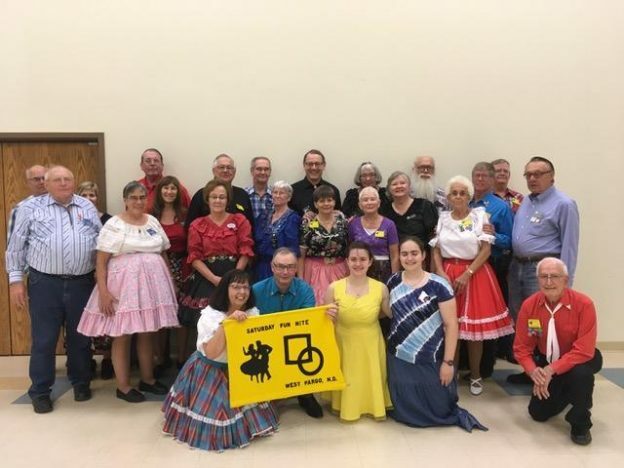 September 22, 2018 – Saturday Fun Nite Square Dance, Fargo, Caller Roger McNeil, Cuer Bernadette McNeil. Dancers were from Country Twirlers, Circle 8 Plus, Valley Stars, Hot Foot Stompers, L & M Squares, and Saturday Fun Nite. Front and center (holding the banner) are Gail and Dennis from Henryville, IN, who joined the dance. They are dancing in all 50 states and North Dakota was #36!! This entry was posted in Activities on September 23, 2018 by LeRoy.